This picture almost doesn't seem real, but the aquarium promises it is a real photo of their newest great white shark. Just in time for the Labor Day weekend crowds, the Monterey Aquarium has a new and sure-to-be popular great white shark on display. The great white shark was brought to Monterey from Malibu Wednesday night. It is the sixth great white to call the aquarium its temporary home since 2004. All have made it back to the ocean safely. Some stay days, others months inside the aquarium's million gallon Open Sea exhibit. The aquarium's first shark is still its most successful. That shark stayed for six and a half months and was seen by more than a million people. 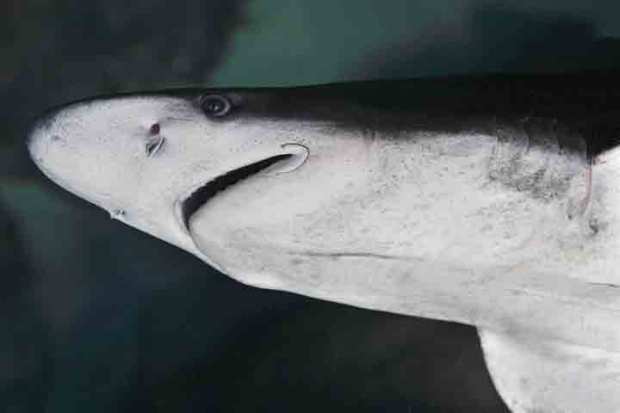 That shark became "the most powerful emissary for ocean conservation in our history," according to aquarium Executive Director Julie Packard. The new shark was caught two weeks ago by aquarium staff. It is 4'7" and only weighs 43 pounds. You can see a live feed from the exhibit at this link. The Monterey Bay Aquarium remains the only institution in the world to exhibit great white sharks for more than 16 days. There is no telling how long this great white will stay. The experts say that is up to them. As long as the shark appears comfortable and keeps eating, it can stay. the fifth more than two months. Again, all of them were successfully returned to the wild.